Discussion in 'iPhone and iPad Games' started by uth33, Sep 4, 2015. In this tile-matching puzzle game, pieces of different shapes are falling down from the top of the game screen, one after the other. You have to move these pieces during their falling using the arrow keys to organize where it lands at the bottom of the game screen, in order to keep a maximum of empty space for the next pieces, because your objective is to get as much pieces as possible within the screen. If you arrange them in such a way that a line becomes full (no empty square), this one will be removed and you gain free room. 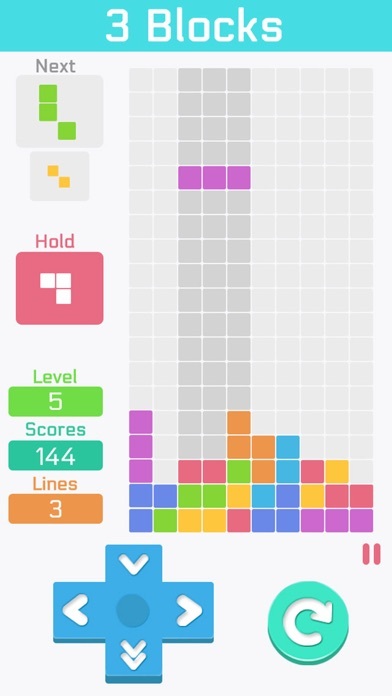 To help you, while a piece is falling down, the next piece to come is shown in the upper left corner. If you should think that a piece is falling down too slowly, you can press the HARD DROP button to make it reach the bottom directly. ENJOY PLAYING WITH 2 DIFFERENT MODES: 1. 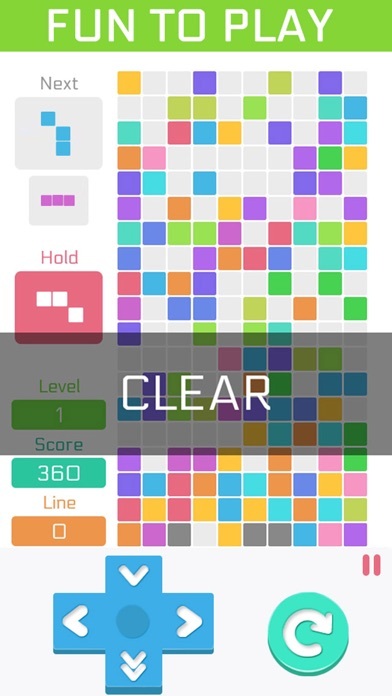 CLASSIC mode: Create horizontal lines compose of 10 units without gaps and get the highest score in CLASSIC mode. 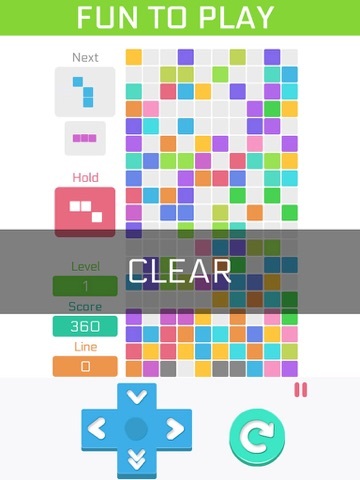 When a certain number of lines are cleared, the game enters a new level. The number of lines required vary upon each new level. 2. SPEED mode: Clear 20 lines as quickly as possible. 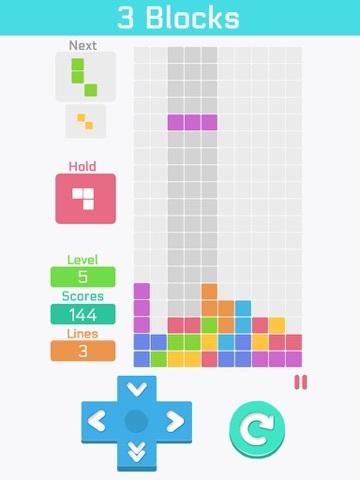 You can control the level to adjust the speed of blocks in this mode. Effect of ‘3 Blocks!’ on the brain: According to research, prolonged ‘3 Blocks!’ activity can also lead to more efficient brain activity during play. When first playing ‘3 Blocks!’, brain function and activity increases, along with greater cerebral energy consumption, measured by glucose metabolic rate. 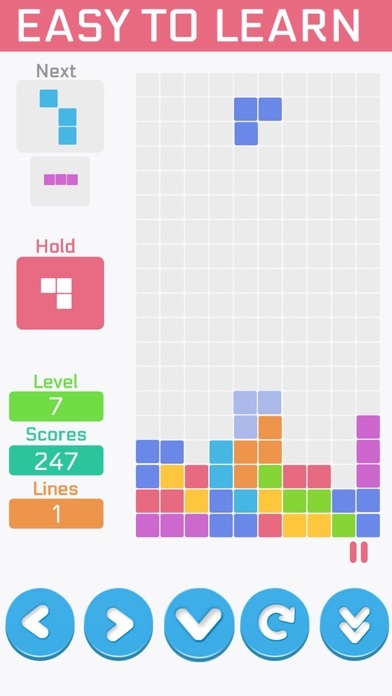 As ‘3 Blocks!’ players become more proficient, their brains show a reduced consumption of glucose, indicating more efficient brain activity for this task. Even moderate playing of ‘3 Blocks!’ (half=an-hour a day for three months) boosts general cognitive functions such as “critical thinking, reasoning, language and processing” and increases cerebral cortex thickness.